The Sony Reader is a worthy opponent to the Kindle, however Sony has made some fundamental mistakes which will ultimately mean it will lose the battle for the e-book. Sony’s chief executive, Sir Howard Stringer, noticed how Apple integrated is software and hardware to create a better customer experience, he added that Sony wants to make it as easy as possible to download or stream music, films and electronic data to all Sony electronic devices, from the PlayStation 3 to the Bravia Televisions. Sir Howard Stringer wants 90% of Sony devices to by wirelessly networked within 2 years. However, Sir Howard Stringer vision seems to have fallen on deaf ears in the Sony Reader division. The Sony PRS-500 Reader had a commanding lead in the e-reader industry, but last November the Kindle was unveiled by Amazon. Amazon had done exactly what Sir Howard Stringer wanted to do with the Sony Reader, the Kindle was wirelessly networked to the Amazon book store, the hardware and software acting as one. Most importantly however, it made it easy for the consumer to buy books, something the Sony Reader never really achieved with its reader. 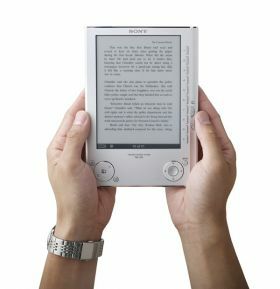 Back in 2006 when the Sony Reader was launched, Sir Howard wanted to let world know that this is sort of device that the new Sony wanted to make: both innovative and well-connected, but it was Amazon that showed them how it was really done. Book selling is at the core of Amazon’s business, this is another advantage that Amazon has over Sony, it can leverage publishers to release books on its platform before any other, that’s something Sony would find very difficult to do. There are currently over 145,000 titles in the Kindle bookstore, the Sony bookstore has 45,000, that’s another area where Sony falls short. The Kindle also offers so much more than the Sony Reader, daily newspapers, blogs, RSS subscriptions all without the need for a PC, with hacks you can even turn the Kindle into an email reader, an instant messenger and a web browser. You can buy a book any time and anywhere as long as you have a wireless connection, you cant do that on the Sony Reader. Sony has consistently declined to release sales figures, which just might tell you something. Whilst Amazon hasn’t exactly been forthcoming with sales figures wither, we have learned that in its first 10 months the Kindle has sold over 240,000 devices, which isn’t a figure to be ashamed of, in-fact it blew most analyst estimates out of the water. To put it in context, the iPod first-year sales came to 360,000 devices, the Kindle is on course to match that figure. Sony is now playing catchup, Sony’s Steve Haber has said that Sony is “open” to the idea of making the Reader a wireless device, but if you ask me, it may already be too late for them. Unless Sony’s next e-book reader is radically different to the current model and offers the same functionallity of the Kindle, im afriad its goodbye Sony Reader. Amazon.com has partnered up with Chase in a rare limited time offer where you can get up to $100 off the Kindle paying a total of $259 for the device – the offer ends on September 8th. Thanks to Chase, you get $100 off Kindle when you get the new Amazon.com Rewards Visa Card. Limited time only. Here’s how this works: 1) Apply Online . Get a response in as little as 30 seconds. If you’re approved, we will instantly add the card to your Amazon.com account and you’ll get $30 back on your credit card statement after your purchase. 2) Add a Kindle to your cart. 3) Place your order using the Amazon.com Rewards Visa Card and enter this promo code: VISACARD to get the additional $70 savings at checkout. Additional restrictions apply. Now you might be thinking why is Chase offering to subsidise you up to $100 for a Kindle, well, they want you to start using their credit card called the Amazon.com Rewards Visa card , and over time Chase hopes to recoup the $100 through interest payments. The promotion is offered and paid for by Chase, not Amazon, so for those who have bought the Kindle in the past couple of weeks, Amazon wont refund you the $70 that Chase is subsidising the Kindle. Once your approved for the card, which Amazon says takes less than a minute, Chase will add $30 in credit to your Amazon.com Rewards Visa card. Once the card is added to your Amazon.com account you can add the Kindle to your shopping cart and apply the “VISACARD” discount code for an additional $70 off. This code will only work if you add Kindle to you cart and go through the normal checkout process and don’t use 1-click, the discount should work even if you already have the Amazon.com Rewards Visa card, unfortunately the $30 credit is for new card customers only. A Kindle for $259 was an offer too good for me to pass, for the last couple of weeks I’ve been thinking about getting a Kindle for my wife, once I heard about this offer my mind was made up – I was going to get it. Once I was approved for the card, sure enough I put the “VISACARD” code in and a $70 discount was applied to the Kindle. My wife’s shiny new Kindle should arrive on Monday, perfect. Now I’m not a big user/fan of credit cards in any case, I religiously pay whatever I owe off every month, but since there isn’t a yearly fee for having the Amazon rewards card, I don’t mind applying for it, I guess it will just sit there nicely in my wallet. If you do decide to go for it, make sure you pay it off and don’t drive yourself into debt, if you don’t trust yourself you can always cut the card up as soon as you get it. A few days ago I detected a certain malady that some Kindle users may have experienced. I have come to learn that there are many more conditions, symptoms and maladies of which I believe my fellow Kindle users should be aware. The list is not exhaustive so please feel free to add any additional items as you may have experienced on your own. Kindle Abandonment Syndrome: The feeling of concern when you cannot find a newly published or previously published book in Kindle format which results in you sending threatening letters to publishing houses or checking the “New on Kindle” site every ten minutes. Kindle Anxiety Syndrome: Worrying that your Kindle will run out of charge before you can reach your home and your charging cord. Kindle Separation Anxiety: This manifests symptoms which include trying to tap the next page button on a paperback or hardcover book, if you still read those! Kindle Agoraphobia: The fear of traveling to a destination that goes not have Whispernet access, like a foreign country, a remote location, or a tunnel. Kindle Envy Condition: This is when people post negative comments about the Kindle on forums without having ever owning one. Kindle Curiosity Malady: This is when you spot another Kindle owner in public and you insist he or she show you what they have downloaded on their Kindle. Kindle Braggadocio: This is when you give a ten minute demonstration of how your Kindle works when someone casually asks if that is a Kindle. Kindle Confusion Malady: This is when you repeatedly lick your finger when you tap the next page button. Tolstoy’s books and you cannot read Russian. Kindle Displacement Condition: This is a condition where you consider your Kindle a member of your family and purchase seven designer covers and extra SD cards but neglect to buy your family milk. purchase of multiple batteries and the constant checking of your Amazon Media Library. Kindle Carpel Tunnel Syndrome: Intense pain in your thumbs from speed reading on your Kindle. Kindle Obesity: This is the insistence that gaining weight is only due to the fact that with a belly you can now read your Kindle while lying prone. Kindle Grammar Abuse: Using the word Kindle as anything other than a noun: such as is it Kindleable? ; can you Kindlize that? Or I don’t do anything unKindled. You may ask is there a cure for these maladies. I fear that no cure is available. My only hope that is when the Kindle becomes universally accepted like the IPod and the laptop computer, these maladies will be readily accepted by the population. Some of these are hilarious and are especially true for me. Do you have any Kindle related disorders you would like to share? I’d like to read this book on Kindle – make it so publishers! The Amazon team have added a new button below any book which is currently not available on the Kindle. The new “Please tell the publisher” button aims to alert publisher of a demand for a particular book by Kindle owners and hopefully prompting them to publish a Kindle version of that book. Our goal is to make every title available for Kindle, and to that end some eagle-eyed Kindle owners and enthusiasts have already noticed and been using a new tool to help us do just that. If you’re frustrated that a physical edition of a book is not (yet) available in Kindle version, just look below the book’s image on its product detail page and you’ll find a box that reads, “Please tell the publisher.” Click on the “I’d like to read this book on Kindle” link and we’ll forward your request. Make your voice heard. Next step is magazines and newspapers which should also have this button. Are e-books ready for technical content? If e-book readers are to ever catch on then they must be able to display all kinds of documents and information, from novels to picture albums to technical documents. This presents a challenge for publishers right now because whist e-book readers are catching on, they don’t posses the technology to display anything other than just words and simple black and white images. A lot of publishers are wanting to put their technical documents on to e-ink devices, however technology in the e-ink industry is limiting how those documents can be displayed. Once such publisher is Dave Thomas from Pragmatic Programmer which publishes technical programming books, as you can imagine, programming books will be full of diagrams, tables, code lists and images — they are really tricky to reproduce for e-book viewing. About once a week, we get a request from a reader to have our books available in a format that can be read on an eBook reader (typically, nowadays, the Amazon Kindle). In fact, we’ve had a prototype form of that capability for a while now, but we’ve always held back. Frankly, we didn’t think the devices worked well with our kind of content. Basically, the .mobi format used by the Kindle is optimized for books that contain just galleys of text with the occasional heading. Throw in tables, monospaced code listings, sidebars and the like, and things start to get messy. The .epub format (used, for example, by Adobe Digital Editions) is slightly more capable, but it also has issues. What do you think, should publishers wait or press on knowing this is the best possible outcome given the current technology? As you may have noticed, there have been a lack of updates recently, however that doesn’t mean we have take our eyes off the ball. Amazon updated their website today and it shows that the Amazon Kindle is now now available to order. I know a lot of you had grown inpatient with Amazon and been waiting for this news for quite a while, so now is your chance to grab a Kindle device before (inevitably, I think) the stocks run out yet again. Go to the Kindle Store and get you Kindle!